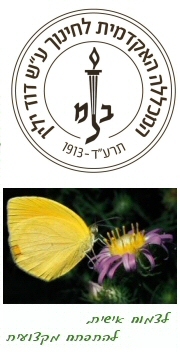 מכללה לחינוך ע"ש דוד ילין נוסדה בשנת תרע"ד (1913) בירושלים, והיא שוכנת בבית אבן ציורי בלב שכונת בית הכרם בבירה. דורות רבים של תלמידים שהפכו למורים ולמחנכים, למדו במכללה. To prepare people for work with individuals and small groups as tutors of English. An emphasis is placed on teaching children with learning disabilities. This course is meant for native speakers of English or for Israelis with a high level of proficiency in English. Candidates must have had at least two years of academic study and basic computer skills. Course participants may credit courses towards a B.Ed. for Teaching Certificate. Academic record and personal interview. This program provides training and professional enrichment for people interested in, or already working as, editors of written communications in the English language. The program imparts skills needed for the preparation of publication-quality texts for use in both print and electronic media. The program is designed for individuals interested in developing and refining their editorial and text analysis skills for professional application and personal enrichment. Emphasis is placed on: 1) achieving competency in developmental, content and copy editing, proofreading and formatting, 2) enhancing language skills (grammar, spelling, punctuation, composition and style), and 3) acquiring the analytical skills needed to assess and develop texts (editorial scholarship). Frontal presentations, in-class exercises, readings and homework are integral parts of the program. Knowledge acquired in the first semester is applied during the second term through the preparation of publication-quality texts encompassing a full range of editorial functions. Among the applied projects undertaken during the second semester is the preparation of The 21st Century Text, a digital journal that will be entering its third year of publication. The 21st Century Text reports on developments and issues related to writing, editing and global English. Students are exposed throughout the program to both subject (e.g., academic, scientific) concentrations and functional (e.g., line editing, copy editing) specializations. (1) An entrance exam assessing English language proficiency, (2) a personal interview, (3) an undergraduate degree, and (4) word processing and other basic computer skills. Preference will be given to candidates with experience in editing, writing, translation or related fields. Successful completion of the program will lead to a certificate from the David Yellin Academic College. The goals of So You Want to Write are to imbue students with an appreciation of the creative writing process and to introduce students to the elements of creative writing: description, setting, voice, point of view, characterization and scene/narrative. The language of instruction is English. Bi-weekly reading assignments of short fiction and creative nonfiction will introduce students to the multitude of options for expression in these genres. Students will engage in in-class writing exercises, keep a private journal, and develop skills in rewriting. The second semester will be devoted to workshopping original work. The course is open to both beginning and emerging writers in English. Total of 28 academic hours. Application is made by forwarding your CV and a one page essay (double-spaced, 12 pt. type) stating why you want to take this course. סטודנטים עולים, מורים עולים ואקדמאים עולים בתכנית ל"הסבת אקדמאים להוראה". הכשרת העולים להוראה על-ידי שיפור ידיעותיהם בשפה העברית. תעודת בגרות מחו"ל המקנה זכות קבלה למוסדות להשכלה גבוהה. הקורס יקנה ידע בסיסי בערבית מדוברת לתלמידים ללא רקע עם השפה הערבית במטרה לפתח מיומנויות תקשורת בסיסיים (בעיקר דיבור והבנה) בקרבם. שפת ההוראה תהיה בהתחלה מיזוג בין ערבית ועברית וככל שהקורס ילך ויתקדם תפחת העברית ותגבר הערבית, כך שלקראת סוף הקורס התלמידים יוכלו להתנהל בסביבה ערבית לחלוטין.